Sameer is one of the leading jazz drummer / tabla players based in NYC. He is the disciple of tabla maestro Pandit Anindo Chatterjee, the founder of Brooklyn Raga Massive, and a very busy performer and teacher traveling throughout the world spreading music. 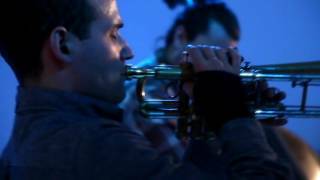 BRM featured in Lincoln Center's "OFFSTAGE"
September 23rd, 2016 - On the 89th birth anniversary of the saxophone legend John Coltrane, Brooklyn Raga Massive gave homage to his music legacy with a stirring rendition of 'Naima'. Presented at Pioneer Works in Red Hook Brooklyn. Golden-Era Bollywood with a modern Jazz soul, NAMASKAR is a fresh and innovative approach towards jazz, Indian and soul music, embodying the integrative spirit of our time. The ensemble combines well known compositions from the Indian Golden Era of Bollywood with North and South India ragas, and modern American jazz in all its diversity, to craft an irresistibly beautiful artistic statement. Percussionist Sameer Gupta, known as one of the few percussionists representing the traditions of American jazz on drumset, and Indian Classical music on tabla, leads a world-class ensemble featuring pianist Marc Cary, who adds an urban inflection with his vibrant acoustic piano and fender rhodes gliding effortlessly between jazz and Indian themes. 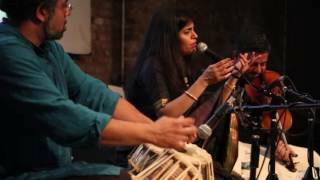 Brooklyn Raga Massive pays homage to John Coltrane; brilliant composer, cornerstone of American Jazz, and huge influence on members of the BRM collective. Percussionist and musical director, Sameer Gupta, conceived of the Coltrane Raga Tribute in 2015 as a reflection of the relationship between Indian Classical Raga music and American Jazz through the legacy of John Coltrane. The ensemble comprises of several traditional Indian instruments seamlessly blended with Jazz instruments that defined Coltrane's sound. The meditative and transcendental qualities of both musical subjects make this Tribute particularly rich and meaningful to the diverse worldwide music audiences who have been drawn to these styles. 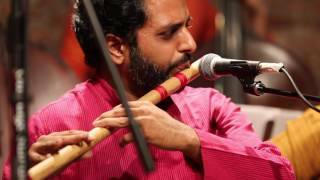 Indian Classical Music has touched and influenced people from around the world. 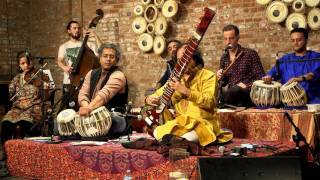 <b>Brooklyn Raga Massive</b> takes you on a raga-music journey, presenting pure classical ragas from India to contemporary adaptations in America, which have taken various shapes as a result of pivotal musical collaborations. 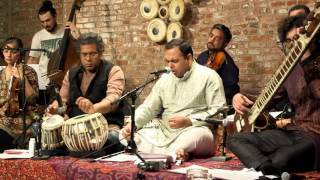 A deeply diverse collective, Brooklyn Raga Massive artists are rooted in traditions ranging from Carnatic to African to jazz. 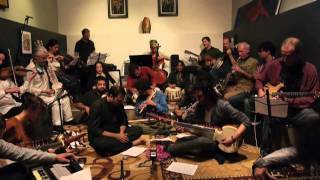 While honoring pioneers like Ravi Shankar, John Coltrane and others, the collective also presents original visions of raga music, reflective of their ties to various communities, cultures, and experiences as artists in today’s world. 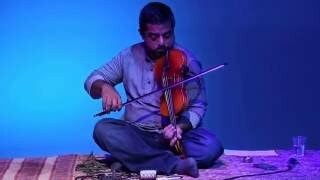 Indian classical music is usually a soloistic, lonely affair. 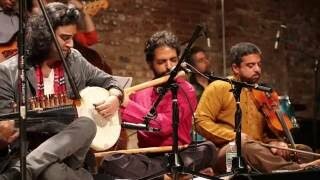 Hindustani ensembles rarely number more than 3 or 4 and usually it is just 2 (melody and percussion). 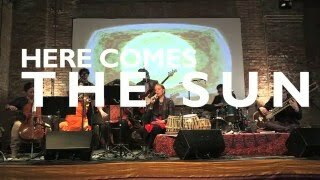 As our community grew past critical mass, BRM co-founder Neel Murgai was excited about the possibility of creating a super group of musicians, the Brooklyn Raga Massive All Stars: an orchestra with sitar, sarod, bansuri, violin, dilruba, harmonium, tabla, vocals, violin, cello, bass, guitar, vibes and more. He realized that Terry Riley’s seminal minimalist composition “In C” would be a special way to achieve that. A work that is written for any number of any kind of instrument, “In C” consists of 53 small cells of music and a set of directions that allow each performer to move through the music at their own pace. 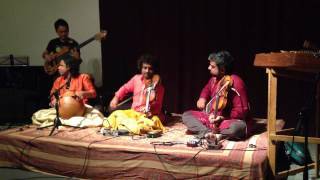 Arun Ramamurthy Trio - "Walk As One"
This video is an excerpt from Coltrane Raga Tribute and Birthday Concert on Sept 23rd 2015 at Pioneer Works in Red Hook, Brooklyn. The event was dedicated to exploring the connections between the Coltrane Legacy and the music of India. This song"Blue Nile" composed by Alice Coltrane, was originally performed on "Ptah, the El Daaoud". 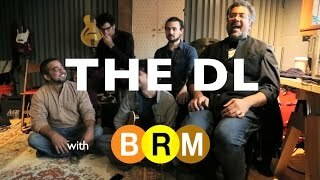 $10 Advance | $15 Door | 8PM Doors | 8:30PM concert | BRM Weekly Raga Jam- 10pm Featuring two close musical collaborators in a unique duo setting. 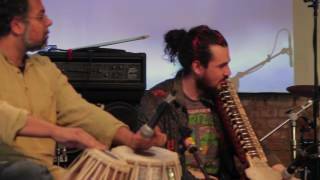 In this format, Gupta and Benjamin experiment with structure, tradition, and improvisation, pushing the boundaries of their own musical expression. Pawan Benjamin - Saxophone / Bansuri / Shehnai / Electronics Sameer Gupta - Drumset / Tabla / Percussion **Special announcement for Musicians! ** BRM cordially invites you to join us in the ongoing effort to cultivate a home for intercultural musical dialogue. We are happy to offer FREE ENTRY TO MUSICIANS AFTER 10 PM WHO COME WITH THEIR INSTRUMENTS AND ARE READY TO PLAY! Please come out and engage with one of NYC's most vibrant and diverse communities of improvising musicians hailing from all over the music world! $10 Advance | $15 Door | 8pm Doors Open | 8:30pm Music | BRM Weekly Raga Jam- 10pm Sitar recital with Tabla Raised in a musical family, Josh Feinberg was introduced to music through classical piano at four years old and later, the bass at eight. 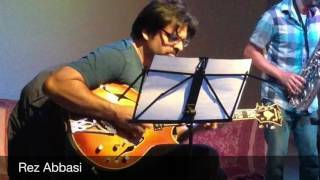 Through his jazz studies with Dan Weiss, Josh was introduced to North Indian classical music. Josh received his initial training on sitar from Vijaya Sundaram. While at New England Conservatory of Music in Boston, Josh studied sitar with Dr. Peter Row and Dr. George Ruckert, and khyal and raga theory with Sri Warren Senders. In 2013, Josh released his debut CD Homage featuring Pt. Swapan Chaudhuri playing tabla. His second album, One Evening in Spring featuring Pt. 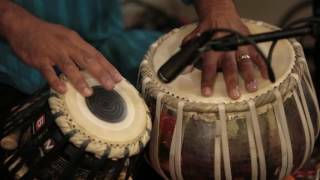 Anindo Chatterjee on tabla, was released in 2014. A dedicated teacher, Josh holds regular classes in Portland and to students around the world via online lessons. Josh is a faculty member at Lewis and Clark College, Reed College and Marylhurst University, and has served as a faculty advisor at Prescott College. Also an author, Josh wrote a sitar manual called the Sitar Method for the Hal Leonard Corporation—the worlds largest music publisher. Josh’s sitar method book is available for purchase on his website (www.joshfeinbergmusic.com) and throughout the world. An updated version of the Sitar Method will include a video as well. Josh is committed to the idea of music as a universal language, which contains the power to bring together people from all cultures and walks of life. He currently resides in Portland, Oregon with his poet-wife Jessica, his daughter Sophia, and his son Noah. Josh holds a Bachelors from the New England Conservatory of Music, and a Masters of Fine Arts from Goddard College. **Special announcement for Musicians! ** BRM cordially invites you to join us in the ongoing effort to cultivate a home for intercultural musical dialogue. We are happy to offer FREE ENTRY TO MUSICIANS AFTER 10 PM WHO COME WITH THEIR INSTRUMENTS AND ARE READY TO PLAY! Please come out and engage with one of NYC's most vibrant and diverse communities of improvising musicians hailing from all over the music world! $10 Advance | $15 Door | 8pm Doors Open | 8:30pm Music | 10pm BRM Weekly Raga Jam “A joyous and remarkable union of classical Indian music and jazz” Arun Ramamurthy Trio (ART) brings a fresh approach to age-old South Indian classical repertoire. The trio’s collaborative sound is driven by the propulsive rhythm section of drummer Sameer Gupta & and bassist Perry Wortman. The Carnatic canon is remixed in this seamless integration of styles as the group expands on the traditional compositions in explosive, improvisational flights of fancy. Arun’s original work pays homage to Carnatic rhythmic structures and rich, nuanced tonalities while expanding the music with a modern jazz backbeat. 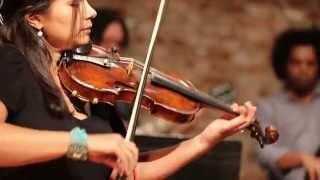 By staying true to raga, the modes which form the melodic foundation for Indian classical composition, but finding the full sonic identity of a skilled ensemble, Ramamurthy’s trio discovers new common ground and moments of organic conversation between two traditions, both based on a balance of rigor and freedom. 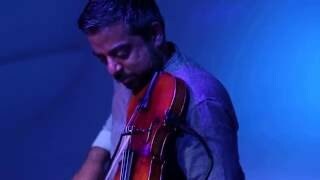 Arun Ramamurthy Trio has performed on respected stages such as Jazz at Lincoln Center, Jazz Gallery, Symphony Space, Kennedy Center’s Millennium Stage, Ragas Live Festival and more. Arun Ramamurthy - violin Perry Wormtan - bass Sameer Gupta - drums **Special announcement for Musicians! ** BRM cordially invites you to join us in the ongoing effort to cultivate a home for intercultural musical dialogue. We are happy to offer FREE ENTRY TO MUSICIANS AFTER 10 PM WHO COME WITH THEIR INSTRUMENTS AND ARE READY TO PLAY! Please come out and engage with one of NYC's most vibrant and diverse communities of improvising musicians hailing from all over the music world!